Grammas then came across Petzl’s climbing products at a mountain sports store. 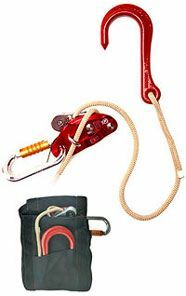 The GRIGRI, Petzl’s time-tested belay device, became the heart of the PSS. After being approached by the FDNY, the company began working with the firefighters to ensure that the adapted product met the research group’s rigorous specifications, making it suitable for use in emergency situations. Petzl initially hesitated before taking on the project. "It was kind of a new thing for us — bringing a product to the market which, if it is needed, has to be used in a matter of seconds to be effective," said Work and Rescue Division Manager Michel Goulet. Initially, Delisio and Grammas worked to make an appropriate anchoring hook in an FDNY-owned foundry, but were unable to produce one strong enough to meet their needs. They contacted the Crosby Group, an Oklahoma firm that creates many small hardware devices used by firefighters, which swiftly designed a hook of the proper size and strength. In addition to its low weight, the Personal Safety System is designed to be a manageable part of a firefighter’s turnout gear. The PSS is secured in a Kevlar pouch with Velcro fastening, which allows easy access, even with gloved hands. Its rope, which is cut resistant and can tolerate temperatures of more than 900 degrees, is designed to play out easily, preventing knots. The central feature of the PSS is the Petzl EXO controlled descent device, which allows a user to slow or stop a descent easily and safely. The testing phase for the PSS was not without its challenges. In October 2005, the rope inside the EXO became jammed and began to fray during a training exercise. The PSS was recalled, and FDNY members once again met with Petzl engineers, who proposed an innovative solution to the problem: a u-bolt to guide the rope away from the channel where it snagged. The updated design has eliminated jamming. The tightness of the u-bolt around the rope is also adjustable, allowing the user to add or release friction for more control over the speed and 'quality' of descent. The Crosby Anchor Hook, the only hook that meets current NFPA standards for use by firefighters, is another key component of the PSS. Its forged-steel pointed end allows it to penetrate building materials, including brick, when a firefighter pushes it into an anchoring location. While it is ideal for hooking around a window ledge, a process called "sill anchoring," its versatile design allows other attachment options, or "remote anchoring." Distributors recommend remote anchoring by passing the hook around a substantial object and attaching it to the rope using a clove hitch knot. Petzl now produces a commercially-available version of the system, known as the Personal Escape System, which is sold through distributors. Anyone buying the system is required to schedule an eight-hour training course for end users to be authorized to use it. "We have an obligation that anybody who buys the system needs to contract with an authorized trainer," Goulet said. "We certainly don’t want firefighters who may not have rappelling experience to injure themselves."